Fans of The Daily Show love Jon Stewart for his ability to switch gears from comedic to serious to hard-hitting in the blink of an eye — and often in a single episode. During his tenure on the show, Stewart consistently elicited a range of emotions from his viewers. His monologues remained sharp, well-written, and hilarious, while any politician or pundit who agreed to a guest appearance knew to come prepared or risk being skewered. 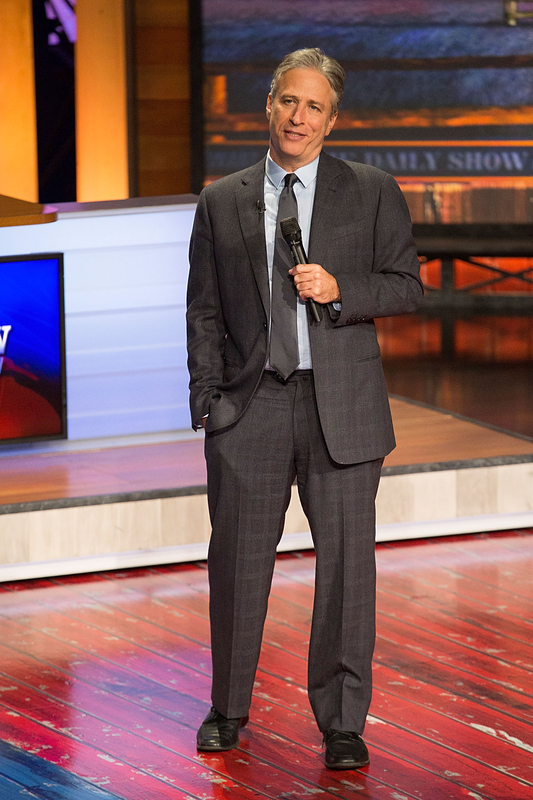 Stewart's final episode on The Daily Show combined nostalgia with his signature, biting wit. Still, it was nothing if not bittersweet. Many of us couldn't help but cry through our laughter as we watched his reign come to an end. Jon Stewart's final words on The Daily Show were heartfelt as he thanked the network, his staff, his family, and the audience. Stewart kept his final words brief and gracious as he thanked Comedy Central for giving him this opportunity 16 years ago. He gave us, the audience, a shout-out for providing him and his staff with energy on the days when they didn't have it themselves. A particularly sweet moment was when he thanked his wife and two children for "showing me what joy looks like." Finally, he credited an artist he admires for describing art as a conversation: "This is a conversation. This show isn’t ending. We’re merely taking a small pause in the conversation," Stewart said, before joking that he has selfishly dominated the conversation for the past 16 years. Nothing ends. It's just a continuation, not a goodbye. Rather than saying goodbye or goodnight.... I'm just going to get a drink. And I'm sure I'll see you guys before I leave. It was the perfect goodbye — humble, gracious, and just self-deprecating enough. And they really summed up why we love Stewart as a person — he knows when to be sarcastic (almost all the time!) and when it's best to wear your heart on your sleeve. The best comedians and the strongest men know it's OK to tear up and to be sentimental. Throughout the show's run, Stewart wasn't afraid to cry when it was appropriate — whether it was tears of grief after the 9/11 attacks or joy upon Obama being elected. And that's truly why The Daily Show has been so influential and memorable. Stewart has seen us through some of the most tumultuous, heartbreaking, and inspiring moments in recent history, and it's hard to imagine the 2016 election and beyond without him. But he left us with years of memories and the comforting reminder that the conversation is far from over. We haven't seen the last of Jon Stewart by a long shot, and that's something to be grateful for.